Moneys Creek fish kills: Whose problem is it anyway? IT'S muddy waters over who will take responsibility to fix issues at Moneys Creek lagoon. It's hard not to get the feeling of deja vu as more fish continued to wash up dead on the waters surface yesterday. Bargara community members have become vocal across social media as day after day more fish are lost, which started on March 16. The lagoon resides on Bargara Golf Club land, but president Janine Smith yesterday said the club could not afford the costs of dealing with such a large-scale issue. "We're trying to get funds through Burnett Mary Regional Group with the council's help to fix the problem," Mrs Smith said. "The problem has been there for many years - 2008 was when we first started to get it fixed, and it all fell through." Mrs Smith said the discussions with council and BMRG were a step in the right direction, considering council had not been interested in the problems surrounding Moneys Creek in the past. "There is progress but it's very frustrating - the wheels turn very slowly," she said. "We have got further, we've actually got Jack Dempsey onside." She said tests had been undertaken previously but the funding, if approved, would likely go towards an updated test to help identify what was in the water and the best solution to resolve the issue killing the fish. The Burnett Mary Regional Group (BMRG) is a not-for-profit organisation focusing on natural resource management in the area, and a spokesman said it was in the process of applying for funding to improve the entire waterway, which would be submitted to the state Department of Natural Resources, Mines and Energy towards the middle of next month. Mayor Jack Dempsey has called on the state government to provide funding and resources to fix the issues. "Council is one of many stakeholders involved with Moneys Creek and we've been trying for years to get the government interested in helping with a long-term solution," Cr Dempsey said. Divisional councillor Greg Barnes, responding to social media commentary on Monday, said it was a "ridiculous situation" that required government intervention. 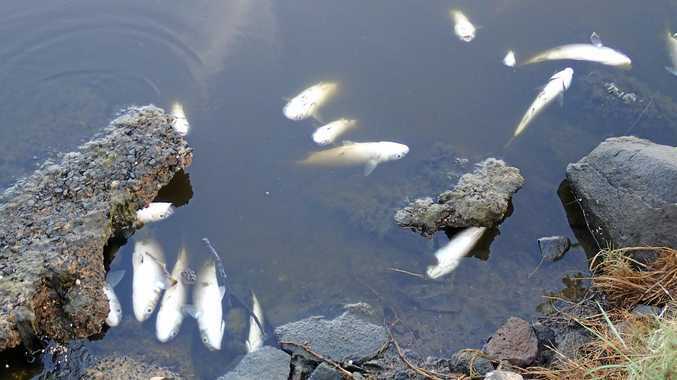 But the state government has indicated to the NewsMail the issue was a council matter, and confirmed the Department of Environment and Science was aware of the recent fish kills. It's a position reinforced by a letter the state has sent to Darryl Hampson, a Bundaberg resident who has advocated for years for the problem to be addressed. On January 4, the department responded to his concerns about water quality at the lagoon, saying "the department has reviewed the information provided by yourself and Bundaberg Regional Council and determined that no further action will be taken in response to the matter". "Bundaberg Regional Council has been encouraged to identify all environmental risk associated with the activities conducted at Moneys Creek on an ongoing basis and to implement strategies to effectively address them," it said. Mr Hampson said opportunities had been missed to flush out the area by not opening the causeway gates during full or new moons, where high-tide was reaching over 3m. "They're not opening the tidal gates enough - with these dry conditions we've got the algae blooms in there," he said.